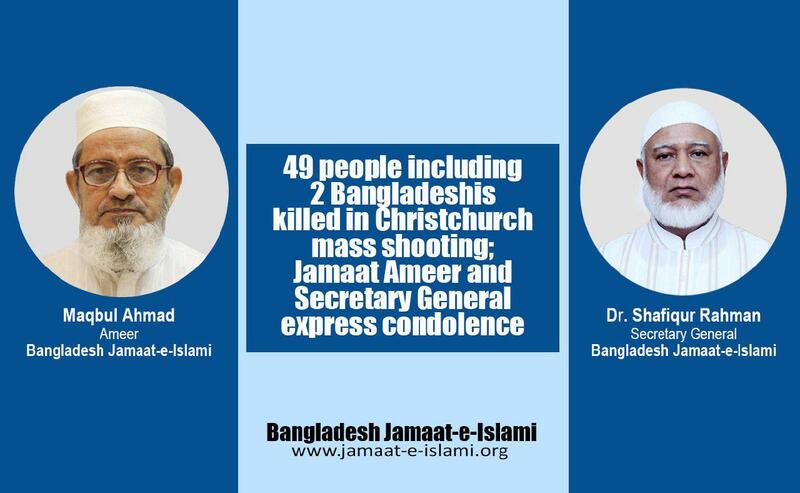 Bangladesh Jamaat-e-Islami’s Ameer Maqbul Ahmad and Secretary General Dr. Shafiqur Rahman have jointly issued the following statement on 15 March 2019 expressing deep shock as 49 innocent people including two Bangladeshis have been killed in an incident of mass shooting at two mosques in the city of Christchurch in New Zealand today. ‘We are deeply shocked and saddened as 49 innocent people including two Bangladeshis have been killed in an incident of mass shooting at two mosques of the city of Christchurch in New Zealand during the congregation for Friday prayer today. Along with peace-loving people across the globe, we are also dismayed at this incident. Though such grievous crime is unusual in a peaceful country like New Zealand, but this type of incident is happening elsewhere in the world repeatedly. The visiting Bangladesh cricket team members were set to attend Friday prayer in the same mosque. They were close to the site but could not get into the mosque as the attackers began their murderous role in the meantime. However, we are expressing our deep gratitude to Almighty Allah as they remain unharmed. We firmly believe that, terrorists do not belong to any country or religion. They have only one identity and that is, they are terrorist. The peace-loving people all around the globe cannot be remained hostage to some terrorists, who are insignificant in numbers. So, people of all walks, irrespective of their ethnicity, race, color and religion should come forward to take some united efforts against these terrorists. We hope and believe that the government of New Zealand will find out all the terrorists and ensure their exemplary punishment. We are praying to almighty Allah to accept all the victims of these mass shootings as martyrs and extending deep sympathy towards their families. We are also praying for the quickest recovery of the injured people.